The law of unintended consequences applies, always. After Harley-Davidson stated their anger at Trump's Tariffs, and announced a move of production overseas, the effects of the resultant Trade War with China and soon, the EU, are becoming more visible. Not least among the hard-core Trump fans. 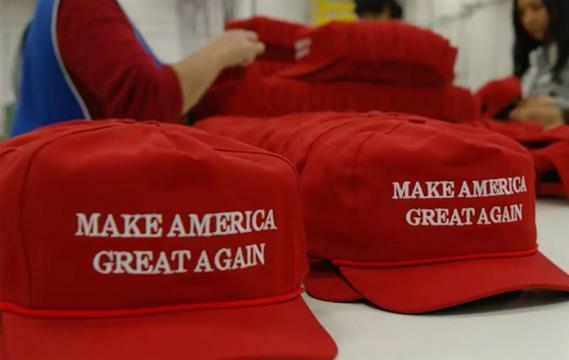 The California-based company that sells the China-made "MAGA" hats says its prices will rise in response to trade tensions with China prompted by the tariffs. We usually sell the MAGA hats for around $9 to $12. But it could go up to $20 if we had to make them in the U.S. and embroider them here. There might be a limited quantity [of hats] in the future. We’re trying to make sure we have enough hats in stock now, so if things change, we’re prepared. The hat, Lassoff said, is his website's best-selling item. Background : Trump has battled China in recent months over trade issues, most recently announcing a potential $200 billion sanctions package targeting the country over what he says are unfair trade practices. The package's size is roughly equal to China's total exports to the United States, according to White House officials. China has responded to Trump's previous trade actions with reciprocal measures, including tariffs targeting soybeans, grains and other exports that affect a number of states that supported Trump in the 2016 election.